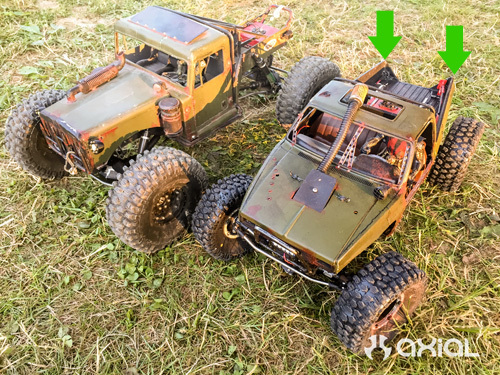 Throughout this series, we discussed how the out of the box 2000 Jeep® Cherokee 1/10th Scale Electric 4WD – RTR and 2000 Jeep® Cherokee 1/10th Scale Electric 4WD – Kit fit within SORRCA guidlines right out of the box with no additional work on your part. With slight modifications, other Axial SCX10 based rigs can be easily altered to fit within those guidlines using Axial accessories. Our fifth focus on getting your SCX10/ SCX10 II Class 1 ready discusses truck bed rules and what they mean if you decide to add a truck type body to your trail machine. SORRCA Rule • Bobbing a truck bed is allowed, but must follow all body specs. An example of “Bobbing” a bed would be to remove the material between the two red lines on the NuKizer body above. After the material is removed, the tail-gate is reattached to the bed. Bobbing a truck bed is the practice of removing a section of the bed from the left to right side between the rear wheel-well and tailgate. This reduction in the overhang lessens the chances of the bed dragging on the ground during an ascent or hanging up on an obstacle as you cross it. 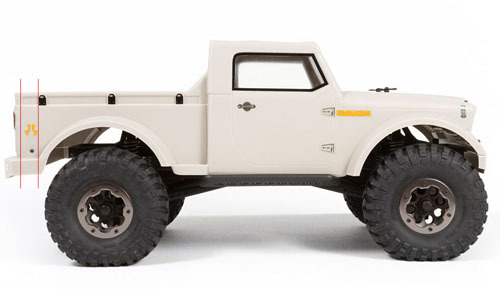 The Jeep NuKizer 715 Body,Jeep Mighty FC Body and 2015 Ram 2500 Power Wagon would be examples of Axial truck bodies with beds that “could” be Bobbed. But these vehicles already have short rear sections and the implications of reattaching a Lexan tailgate on bed with minimal performance gain detours most custom modelers. Bobbing can’t be done on an XJ or Wrangler body either as this falls into the sectioning rule discussed in Part 4 of this series. SORRCA Rule • Dovetailing is not allowed. Dovetailing is the practice of angling the fenders in towards the center of the vehicle. This requires the center section of the hood or bed to be narrowed at the end and remains wider at the center of the vehicle. Dovetailing improves clearance of the vehicle when approaching obstacles on the trail. 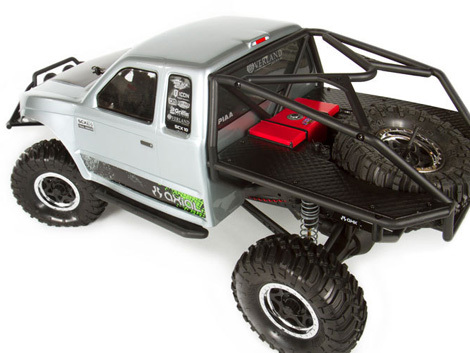 Factory Axial bodies are designed to look scale with approval from licensing partners so the vehicle is represented properly. Any Axial scale body will conform to this rule unless you modify it. SORRCA Rule • Truggies are not allowed. Flatbeds with full length rail chassis are allowed. The bed must be as wide as the cab the entire length of the bed. Cab only not allowed. Truggies look pretty cool, we’ll admit it, hint hint Honcho! But unfortunately the Honcho body from Axial would not fit into Class 1 SORCCA rules. A truggy is made up of a cab with a cage style rear bed, a specialized vehicle you would hardly ever see on the road. Flatbeds however are seen on the roads so there is no stopping you in locating a Honcho body or using the cab from the Dodge Ram and fitting a custom made flatbed to your SCX10. Keep in mind that the flatbed must run the length of the frame rails and must be as wide as the body you use. When getting your SCX10 model ready for a SORRCA event, many will be able to skip this focus here when using a factory XJ, Rubicon, or Wrangler unlimited Axial body. But Axial does offer options for you to get creative with traditional bed equippped truck offerings so you can customize your rig to fit your scale taste. Just one more SORRCA Class 1 Focus to go, and there we will discuss treads. Keep an eye out!